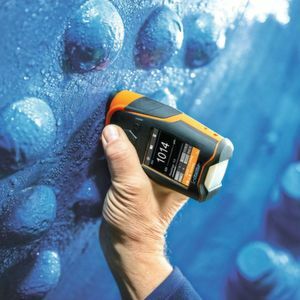 The electronics and measurement technology specialist Helmut Fischer presents a new range of convenient inspection devices for corrosion protection coatings. Première: This product range consists of a three-part set for measuring coating thicknesses, checking surface profiles and calculating dew-points, Fischer tells us. The unique feature of this trio is that it meets protection class IP65 for resistance to dust and water. The top model in code thickness measurement has the name MMS Inspection DFT High and gives precise results using a double measuring probe, we hear. This enables reliable measurements on iron/steel, non-ferrous/ferrous materials, and coatings on such non-ferrous metals as aluminium. The system features automatic selection of the correct measurement method. The MMS Inspection range is designed for comfortable handling, achieved by the one-hand operation, the modern operating surface, and a strongly contrasting, automatically rotating display for every angle of observation. Visit Helmut Fischer GmbH at Hannover Messe in Hall 5, Booth A54. Fundamentals How does stamping and punching of sheet metal work?